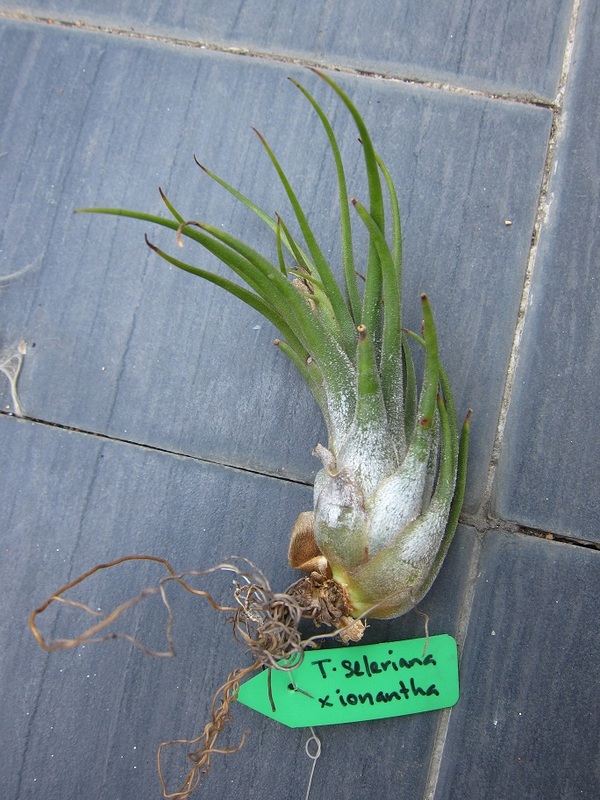 I initially wrote a post about this hybrid plant back in April, and you can find the post here. 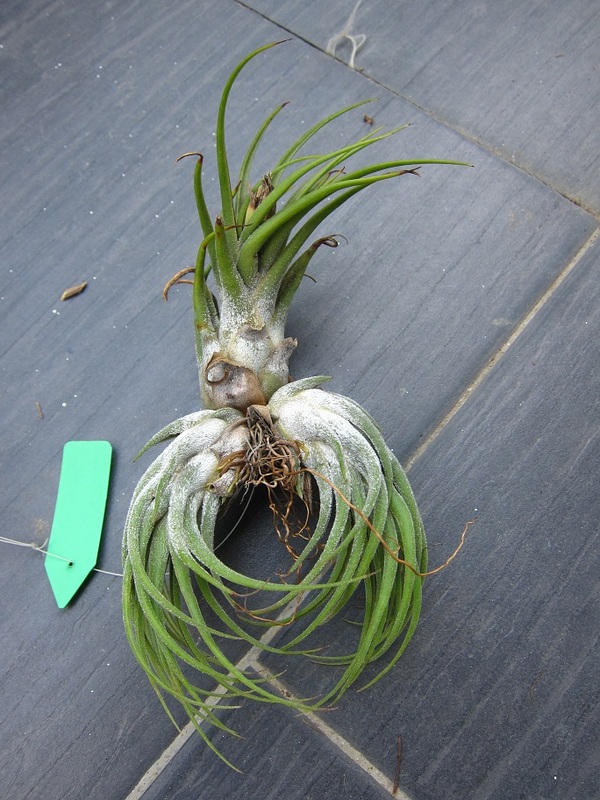 As you can see it was a single plant which had two pups after flowering. Well three months after writing the post, I was looking at the plant and its growth seems to have stagnated, or perhaps it just seems that way to me because I see it so often. 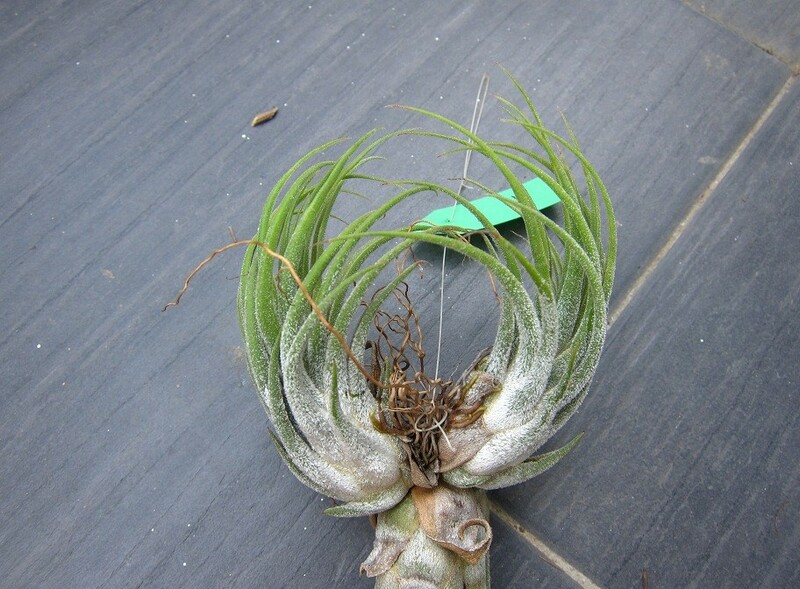 Regardless, I was taking a closer look at it the other day and because the parent plant seems to be in very decent shape still, I decided to remove the two pups. 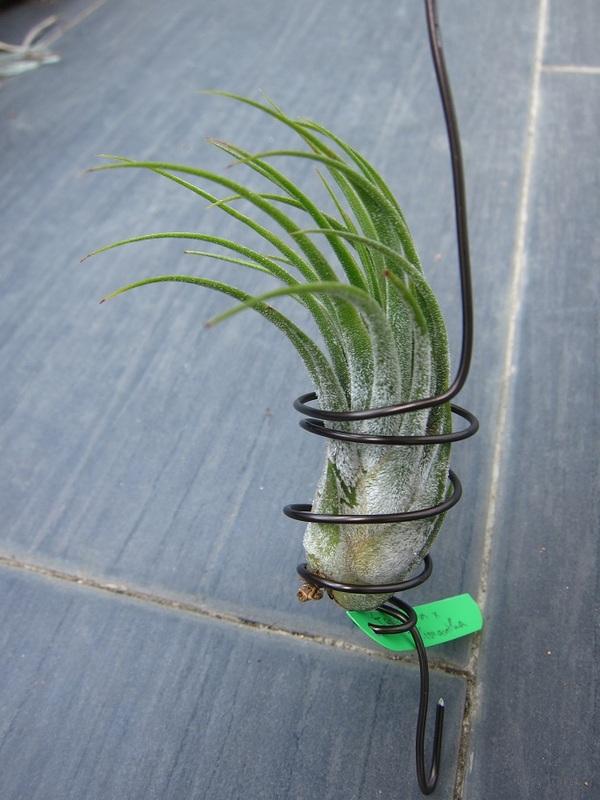 As most of you will know, the parent plant no longer grows post flowering, instead channeling its energy to the pups. 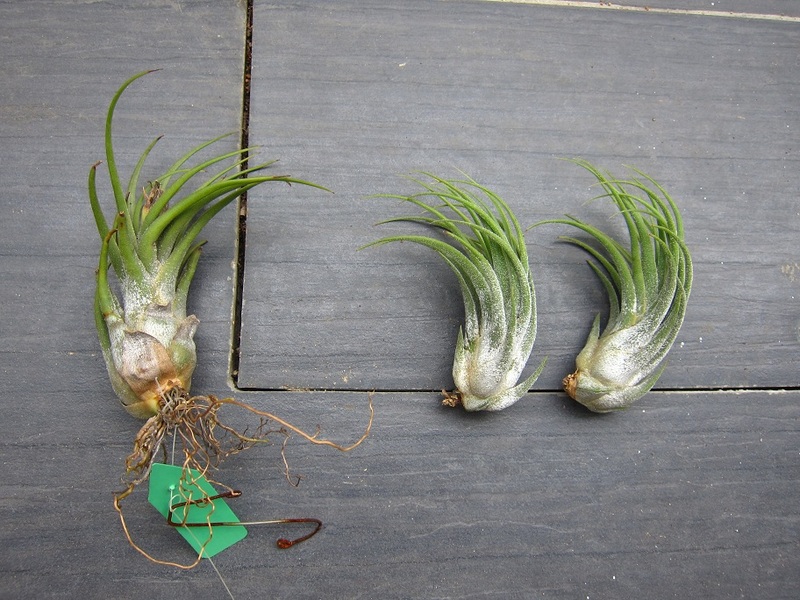 Since the pups are mature enough and the parent plant looks to be healthy, I am hoping that removing existing pups will result in the parent sending out more pups. Here are some pics to show the development over the three months since my original post. 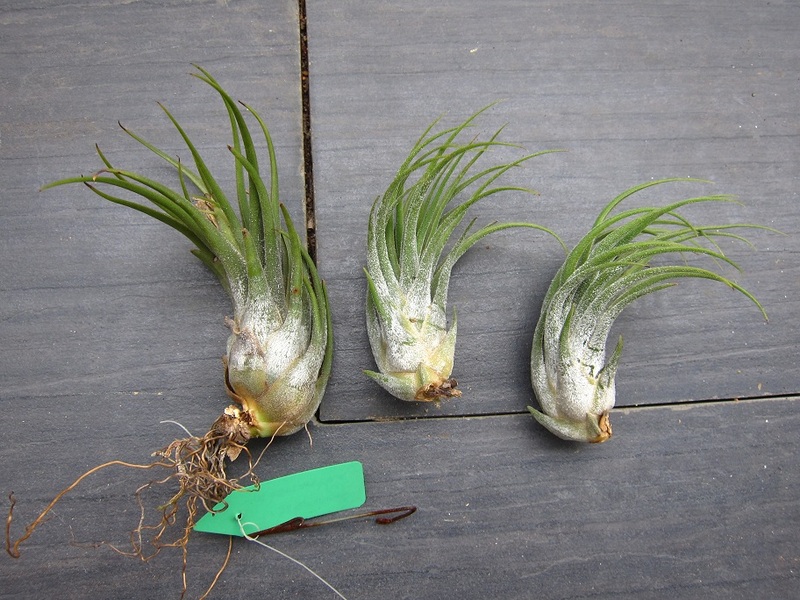 Looking at the pics now I must say there definitely was growth, albeit at the typically leisurely Tillandsia-like pace! If you read my previous post about T. Houston, you will notice that I commented on not daring to remove the pups from that plant. 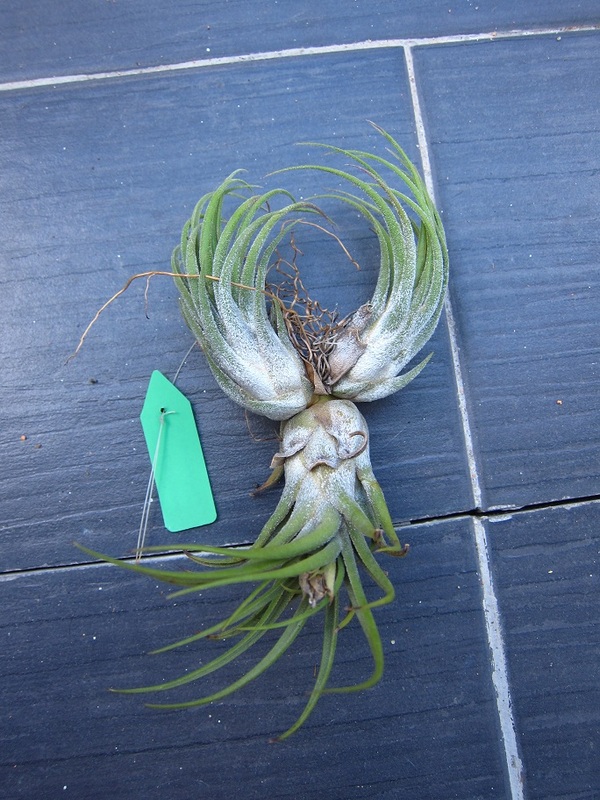 In this case it is very different, with the pups being much easier to separate as it grows from the base of the parent. 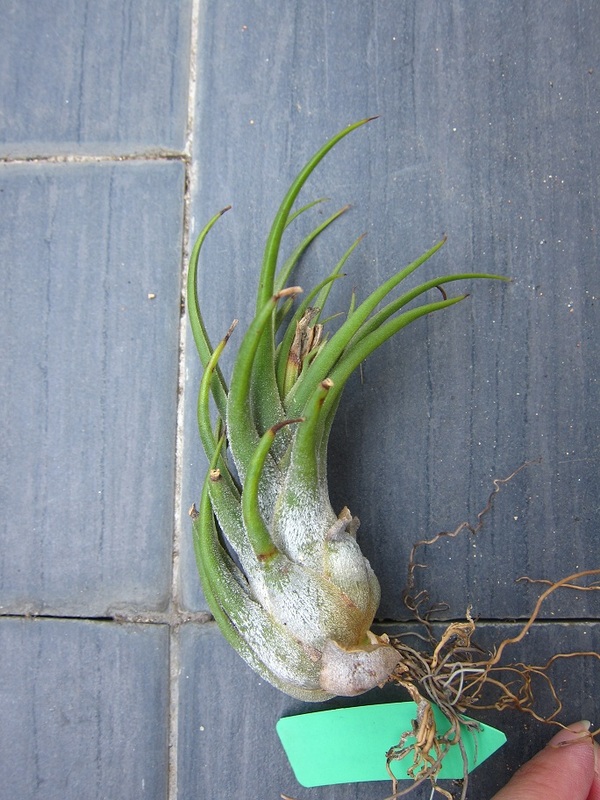 First thing I did was to check the roots to make sure they were not growing on the pup. 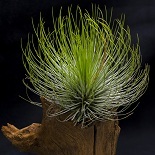 The roots attach to anything they come in contact with, and while it does not harm the plant, it can become rather unsightly, so if I notice I tend to try and direct them away from the plant. 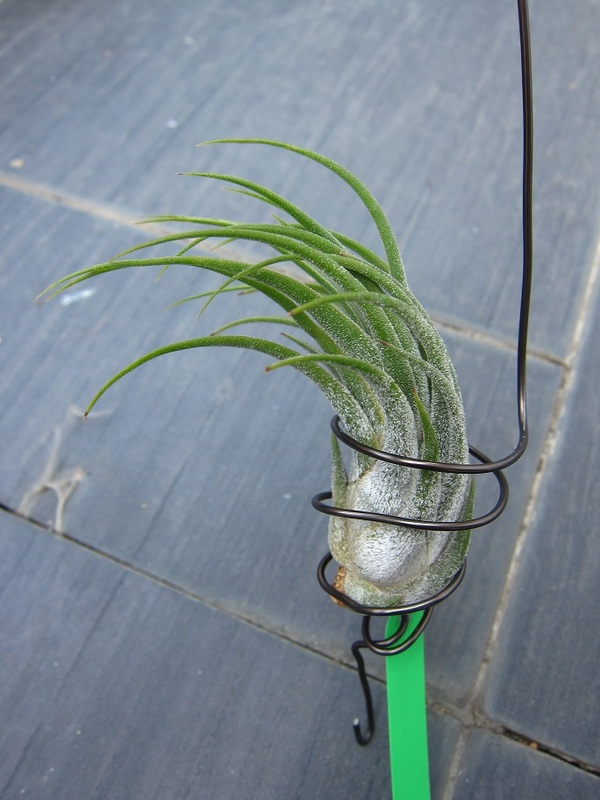 If there are roots growing on the pup, you can either cut it off or in my case I just gently tugged it away. 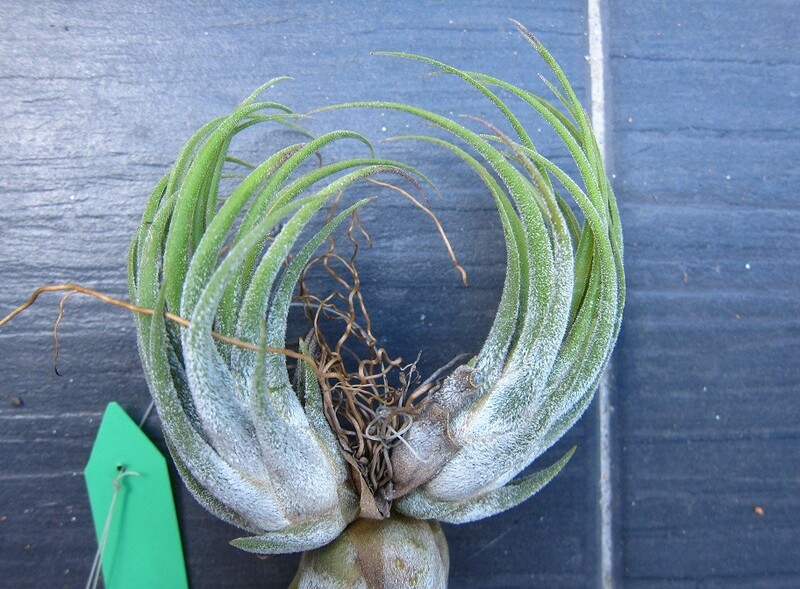 This normally pulls up the trichomes along with the root (the roots are incredibly strong for such a skinny thing), so your options are a bare spot where the roots grew or snipping the roots off at the base and thus have the root remain on the plant. Then I started to wriggle the pups in the hope that they were loosely attached and I would be able to twist it off. By the way, detaching pups purely by twisting and tugging is dangerous unless the pups are loose, because you may end up with a pup with no core – which is never a good thing! I did not want to risk that so I grabbed a sharp knife and cut down as close to the base of the parent plant as possible. It is my first time separating pups so I was probably extra cautious. Thankfully everything went well and about 10 minutes later, I had three separate plants! None of which seemed to be any worse for wear. Note: If you squint when you look at the pic immediately above, you can see the trichome-less lines where I detached the roots. Anyway, I returned the parent back to its original spot and put the pups nearby in a slightly shaded spot. It is probably best not to water the plants for the next couple of days to allow the base time to dry off. After that you can go back to regular care. The pups are already a decent size so there is no need for any special treatment. 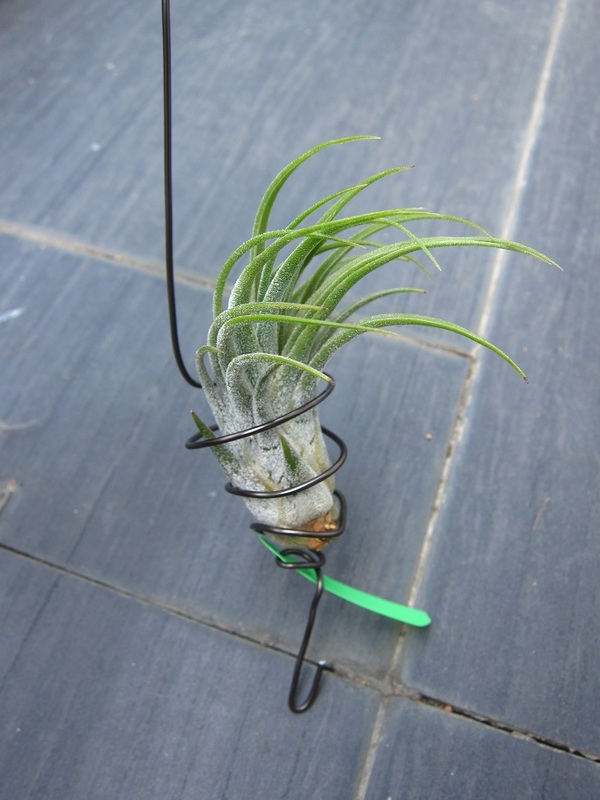 I finally got around to wiring up the pups about a week later. All I have to do now is keep my fingers crossed and hope the parent will send out a couple more pups. Happy growing peeps! Tills are not a fan of copper, so be sure not to use that when wiring them up. Your best bet is to get the aluminum wires from Daiso, which is what I use. Because this will not rust and they are soft and easily pliable, making it much easier to bend. Better yet they are already coiled so you just need to widen or tighten the coil to your needs. Other than that all you really need is a pair of pliers and you should be good. Finally don’t worry too much if you damage a leaf or two, Tills are hardy and will outgrow the damage. Practice will make perfect!! 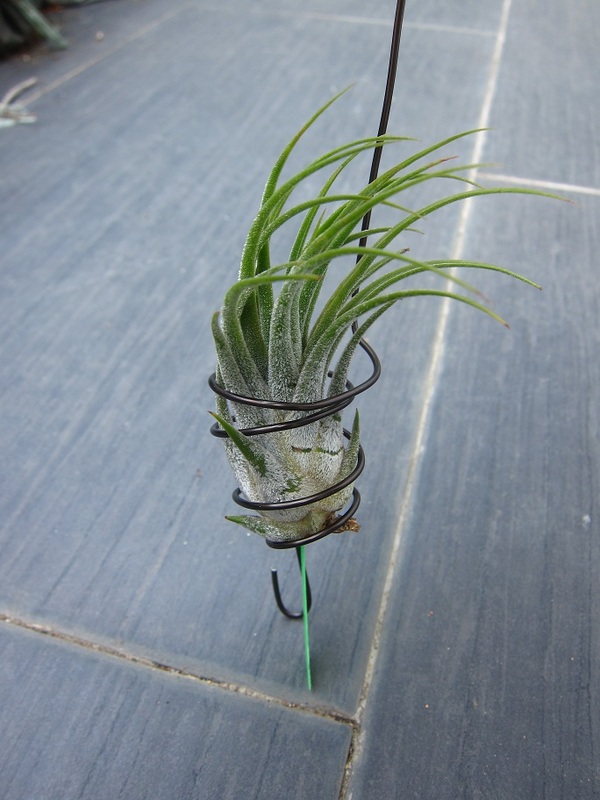 This entry was posted on August 23, 2013 by minigemm in hybrid, seleriana x ionantha, Tillandsia and tagged clump, hybrid, ionantha, Malaysia, offset, offsets, pups, seleriana, seleriana x ionantha, tillandsia. Blog pro všechny milovníky kaktusů, tillandsií a ostatních sukulentů.